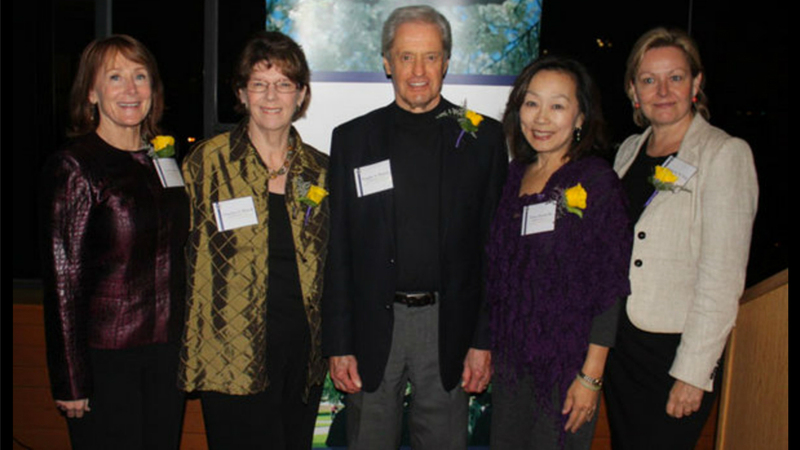 Katherine King, Douglas Ramsey, Elaine Ikoma Ko, Ann Darling and Lorraine Howell each stood behind the podium as new additions to the UW Department of Communication Alumni Hall of Fame last Tuesday. The ceremony was complete with laughs, a few tears and high regards for the inductees and the Department. “Welcome to the debate watch party for this evening,” professor and Chair of the Communication Department David Domke joked as he greeted everyone at the ceremony, coincidentally starting at the same time as the Presidential Debate. The Hall of Fame was established in 2004 and has inducted 61 alumni. Domke proudly admitted that the competition is stiff, but the criterion is simple: People who have made a vital difference in the world. King (B.A., 1983), the writer, editor, digital media leader, journalist, producer and teacher, was the first inductee. “It’s still hard to assimilate that I’m actually in a group as amazing as some of these other alumni,” King said. King focused her speech around the concept of community. King introduced and thanked her friends, family and mentors who she said helped her get to where she is today. Ramsey (B.A., 1956) similarly thanked his wife for putting up with him and moving with him to 17 different houses throughout his career. Ramsey is an award-winning author, journalist, lecturer and American jazz scholar. The next inductee, Ikoma Ko (B.A., 1975) said it was an honor to be in the company of Ramsey and the other alumni being awarded. “It’s been said that the greatest honor is to be recognized by your own peers and that is very, very true,” she said. Ikoma Ko is a community builder and civic activist, mentor and leading communication executive. She also said she is a Husky and always will be. “The award is special because it gives us, alumni, an opportunity to give back and to come back to the very institution that gave us this strong foundation and our wings to conquer the world,” Ikoma Ko said. Darling (Ph.D., 1987) also assured the room that she will uphold her responsibilities as a new inductee of the Hall of Fame. Darling said she owes everything to her parents, who traveled from Albuquerque, N.M., to be at the event. Domke closed the evening with two closing thoughts that struck him during the event: “What a good fortune it is to be part of a department and university such as this and what an incredible privilege it is to have alums like yourselves who come back and invest in us and make our experiences that much better. Thanks to the inductees for who you are, what you have done and what you continue to do.